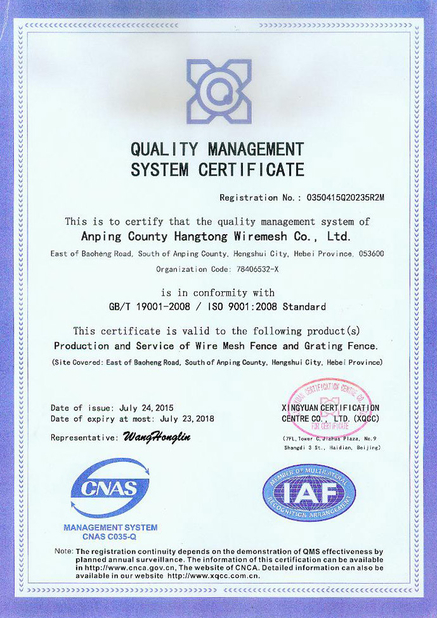 ANPING COUNTY HANGTONG WIREMESH CO.,LTD is specialized in producing ,designing, researching and developing for wire mesh products . 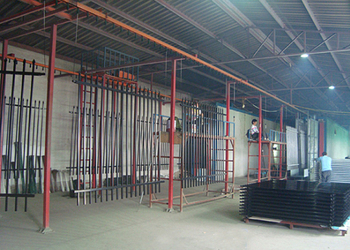 Our company founded in 1996, for near 20 years, HANGTONG became famous brand in wire mesh industry. With our constant abiding by the managing conception in technology and management, We pursue guide in this field. Barbed wire series: Razor wire , Electrophoretic paint razor wire ,Barbed wire , Electrophoretic paint barbed wire. Temporary fencing series: Australia standard temporary fence, Canada standard temporary fence,Chain link temporary fence, Swimming temporary fence, Temporary barrier and so on. Wire series: Hot dipped galvanized wire,Galvanized wire, Annealed wire, Cutting wire an so On. A.We have advanced quality manage system,ISO9001:2008 and CE certification management can let our client satisfied with the top quality of products. B.Our company have excellent equipment: Advanced electrophoretic paint production line, Powder sprayed coating line for anticorrosive,hot dipped PVC coated line,intelligence large scale welded wire mesh machine, automatic cold forming plate machine to make fence post, and also have bending machine, ball blasting machine for clean rust, Injection plastic machine for all kinds of accessories of fence, and other kinds of wire mesh making machine. C.Regarding the raw material we all order from famous company, Steel from SHOUGANG,BAOSTEEL. Powder from AKZONOBEL and DuPont, Electrophoretic coating paint from NIPPON.For this credibility material, to ensure our high quality products. D. We have branch factory for drawing wire, galvanized ,that can exactly control the wire diameter and galvanized quality . E.Our company have over 10 senior engineers. Have enough capability to R&D and design in our products by ourself. In that case we keep our guider in this industry. F.There are more than 100 excellent staff team. To ensure our top quality of products and best service. Hangtong people have been making great efforts for every new customer and never snubbing any old friend for more than 10 years. Trust always begin from the first cooperation and satisfaction also appears after the first service. Sincerely quality and mutual benefit are our forever cooperative footstone. Hangtong people will made greater effort for our brighter future. Hangtong from foundation have always kept the enthusiastically creating and forecasting marketing as our spirit of development. That lies in cooperation of developing department and marketing department. 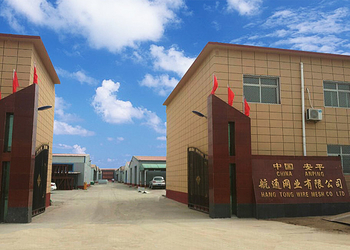 Since 1997, Hangtong’s products take up a proportion of international market. There is large quantity wire mesh products has been export Europe, The Americas, Australia, Middle East, Africa, southeast Asia,etc . The special specification greatly meet the need of customers with high quality ,safety ,beauty and convenience installation. 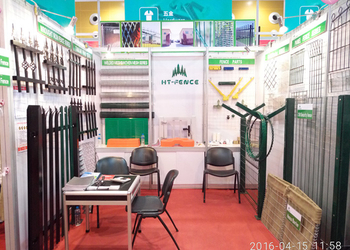 Insulation fencing,Garden fence,Palisade fence, Pressed spear fence,Anti climb fence,steel fence,Welded Mesh Fence etc. Our company have over 10 senior engineers. Have enough capability to R&D and design in our products by ourself. In that case we keep our guider in this industry. There are more than 100 excellent staff team. To ensure our top quality of products and best service.